Does the EU Have an Italy Problem? On 7 February, the French government recalled its ambassador to Rome as a sign of its displeasure over the numerous forays the current Italian government has made into the domestic affairs of its European partner. It came only a few days after the EU failed to establish a common position on the Venezuelan crisis because the Italian government refused to endorse a call for elections. The week’s events are just the most recent manifestations of perhaps Italy becoming the European Union’s biggest headache. The list of issues on which the Italian government has clashed with the EU and its partners includes the question of Russian sanctions, migrants, and economic policy. However, as is often the case in Italian politics, the Italian government’s seemingly constant clash with and in Europe is less and more than it seems. In order to try to make sense of this baroque picture, it useful to provide some background on the composition of the coalition government. Called in Italian the “yellow-green” government, it is composed of the relatively new Five Star Movement (M5S) led by Luigi Di Maio and the Lega, led by Matteo Salvini. The two parties are fundamentally different beasts, both in their positions but also in their very nature. The M5S has been built largely around the Internet, with candidates for elections at every level and positions on issues decided through online polls. The Lega is a party in the traditional sense in that it has slowly built a structure based on a constant presence with booths in town squares and mobilizing party members, primarily in the north of the country. This leads to the two very different electorates of the two parties. The M5S is primarily (but not exclusively) based in southern Italy, taking advantage of the complete collapse of the traditional parties in the area of the country that seems to be in irreversible economic decline; while the Lega thrives in northern Italy, especially in the towns and cities where Italy’s famous small and medium-sized firms dominate. The M5S has promised its voters more social assistance and a bigger role for the state in the economy; the Lega’s voters want taxes and bureaucracy reduced when it comes to economic policy. The two parties seem to disagree about everything, including large infrastructure projects such as high-speed train links. However, it might seem that they do agree on opposition to the European Union and some of its member states, especially France. 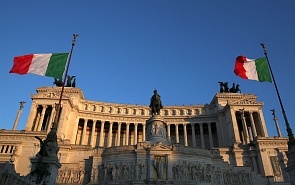 Both parties have expressed their opposition to the Euro and the rules that govern the public spending of its members. Both have harshly criticized their European partners on the migration question and have refused to let rescue boats dock in Italian ports. Both parties have key advisors and figures who have expressed anti-EU positions, on everything from Italy’s participation in the single currency to sanctions on Russia. The M5S has, since 2014, been part of the same parliamentary group in the European Parliament as the party that has led the Brexit campaign, UKIP; while the Lega has been closely aligned with Marine Le Pen’s party in Brussels. It would seem that there is quite a bit of evidence that suggests that Italy is on the path to a serious and possibly permanent confrontation with the EU. However, that would be a rash conclusion for a number of reasons. First, support for the EU in Italy has grown in recent years not decreased, according to public opinion polls. Moreover, most criticism of the EU is not that integration has gone too far but that it has not gone far enough. Italians consistently express a preference for a fiscal union, for a truly European immigration policy as well as foreign policy. Any political party looking to remain central to the political process will tread lightly on pushing forward anti-EU legislation. Second, the Lega seems to have the wind in its sails, largely on the backs of its anti-immigration appeal but it knows that its bedrock of support in the north could become fragile if its created economic instability. There is little risk of the Lega leading a Brexit-style campaign. It may use the same language but it acts very differently. Third, the two parties are too different and are forced into a marriage of convenience that makes it hard to imagine that they could lead a long-term campaign against the European Union. So, it would seem that there is less than what it seems to the Italian government’s image as the EU’s newest problem child. The government is too divided to act in any concrete way and it resorts to powerful rhetoric to mask how little it has actually done. But there is something more to the image and, in some ways, could be more troubling. A deeply divided government without any clear alternative in opposition in a major European economy that has stagnated for over 20 years is a major problem for the EU. Not for anything it might do but because it is incapable of doing anything. The example of the position on Venezuela is emblematic. The M5S supports Maduro while Salvini says he speaks with the opposition on a weekly basis and supports change. The result is that the government has no position and the EU could not act. The real danger is that Italy will become increasingly isolated not because countries will recall their ambassadors but because they will know that their ambassadors will have nothing to report from a country whose politics seem to be paralysed and consumed by its internal tensions. ﻿Two hearts, believing in just one mind… Phil Collins' amazing hit Two Hearts﻿ from 1988 could perfectly represent the status of the current Italian Government. We have two very different and distanced hearts, the Five Stars Movement (5SM) and the League, believing in just one mind which is represented by the very delicate goal to make the government last to May 2019 European elections.